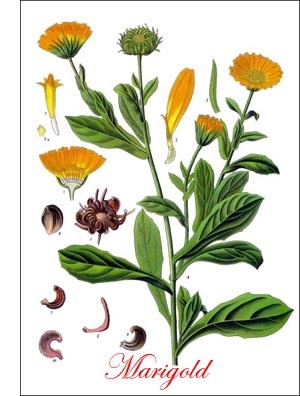 Marigold (Calendula officinalis, Linn.) is an annual herb of the natural order Compositae, native of southern Europe. Its Latin name, suggestive of its flowering habit, signifies blooming through the months. Our word calendar is of the same derivation. Its short stems, about 12 inches tall, branch near their bases, bear lanceolate, oblong, unpleasantly scented leaves, and showy yellow or orange flowers in heads. The curved, gray seeds, which are rough, wrinkled and somewhat spiny, retain their germinating power for about three years. For the garden the seed is usually started in a hotbed during March or April and the plants pricked out in flats 2 inches apart and hardened off in the usual way. When the weather becomes settled they are set a foot or 15 inches apart in rather poor soil, preferably light and sandy, with sunny exposure. Often the seed is sown in the open and the seedlings thinned and transplanted when about 2 inches tall. The flower heads are sometimes dried and used in broths, soups, stews, etc., but the flavor is too pronounced for American palates. One gardener remarked that only a few plants are needed by a family. I think that two would produce about twice as much as I would care to use in a century. For culinary use the flowers are gathered when in full bloom, dried in the shade and stored in glass jars. The fresh flowers have often been used to color butter. Packs up and shuts her gaudy shop. John Cleveland - "On Phillis Walking before Sunrise"
Jean Ingelow - "The Four Bridges"